Suz looks at the guy. She kinda likes his face. But why does he need a car mechanic to tell him this is hopeless? He disappears underneath and Suz doesn’t expect an answer. Ah, bless Suz. That’s gonna be one hell of a job! 😉 is that a bad thing? It may take more magic then thought possible. Yes, I think so, too… Thanks, Jessie! Hope she packed her magic wand! Cute story. I hope they get together. She’ll certainly need it. Thanks, Jenn! 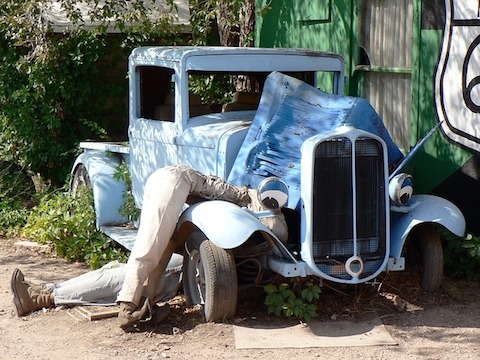 I have a feeling Janey and Suz are going to fix up this “rust bucket!” Cute story Sonya! it’s very sweet that Suz wants to fix this up for her grandfather. Argh, I can’t believe I overlooked a ‘Janey’ in there. I thought that was her name, but turns it she was Suz… Thanks for catching that, PJ! LOL! I didn’t even know it was a mistake. I thought the two girls were working together to fix up the old model A? mode T? I don’t think anyone else noticed. You caught it in time. This is a charming tale and sooo sweet. Lovely work. The flipping of typical gender roles–Suz as the mechanic–is great here. There’s something fun about the idea of magic, too–sort of like the ol’ Chitty Chitty Bang Bang story somehow. It sounds like it really will need magic! Yes, I think magic’s her only hope… Thank you! Miracles can happen but in this case I have my doubts. Yes, I have my doubts, too. Thank you! Tbh, I doubt it will… Thanks for reading! Yes, I don’t know what came over me – usually, I only see the worst in people :D. Thank you! abracadabra.. Let the car be fixed! 🙂 Great story! Indeed :). Thanks for stopping by!